“It’s as if you’re navigating an enchanting cave that continually beckons you onward,” says Marc Wilson, the museum’s director. Whether it’s a street scene by impressionist painter Claude Monet or a colossal sheet of glass in the new Bloch Building, nothing is as simple as it seems at Nelson-Atkins Museum of Art. “When I first saw architect Steven Holl’s watercolor renderings of what the Bloch Building would look like, I thought to myself, ‘This shouldn’t be too bad,’” said Casey Cassias, architect at Berkebile Nelson Immenschuh McDowell Architects, which facilitated Holl’s designs for the Bloch Building. After eight long years riddled by construction setbacks and rampant criticism, the Bloch Building – costing in upwards of $100 million – was finally unveiled on June 9.
he 165,000 square-foot Bloch Building is enmeshed into the landscape of the Nelson-Atkins campus and flows 840 feet along the eastern periphery of the 22-acre Sculpture Park. Five glass forms or “lenses” jut from the earth as if the by-product of a cataclysm. Each is comprised of laminated, acid-etched flat glass, clear flat glass and 6,000 planks of ¼-inch translucent, sand-blasted U-profile channel glass that forms a “sandwich” that can filter a majority of light coming in during the day (creating a restrained luminosity that is gratifying for visitors and, most importantly, easy on artwork, which is subject to harm from too much exposure to ultraviolet rays) and diffuse artificial light outward at night. Inside, long, spacious corridors with white Venetian plaster walls, gray granite and glass aggregate floors and vaulted cathedral-like ceilings connect the five lenses. With every successive step, the corridors contract and expand in a hypnotizing ballet with the rising and falling light. Stairways and ramps also abound, making navigation as free-moving as a dream. Indeed, the Bloch Building presents a truly novice experience – for visitors and builders alike, Wilson says. assias describes the process of installing the lenses as being analogous to a bicycle chain: each piece of glass was 16 inches wide and was tempered and cut to a prescribed measurement in Germany, then sent overseas to be paired with pre-set concrete and steel. The level of precision required was incredible. Since glass doesn’t stretch or contract easily, one tiny misalignment could lead to a monumental setback, Cassias said. Also, much of the Bloch Building is column-free to maximize exhibition space, a characteristic that sometimes implored builders to defy the laws of gravity. “There wasn’t a craftsmen involved in this project who wasn’t challenged extraordinarily,” Cassias said. Despite budgetary concerns and incessant construction delays following the Bloch Building’s groundbreaking in 2001, the finished product remained true to Holl’s initial vision. An example of the meticulous facilitation of Holl’s vision is evidenced by a watercolor rendering Holl submitted to the Nelson-Atkins board for consideration eight years ago. In the illustration, Holl depicts a serene setting in which the Isamu Naguchi Sculpture Court located in lens four is bathed by sunlight filtered through clear flat glass. It offers a handsome view of the Sculpture Park and a breathtaking panorama of the 1933 original Nelson-Atkins building. Today, the sight is identical, so much so that it appears as if Holl did the sketch moments earlier. “The Nelson-Atkins board always supported the bigger vision rather than the easy vision,” Cassias said. he reasons for the construction of the Bloch Building were point-blank. “We were getting so tried for space that I was decommissioning men’s rest rooms to become offices,” Wilson says. In addition to the need for room, Wilson says another common gripe has since been addressed – parking. “We’ve effectively doubled our parking space and it’s all underground so it doesn’t detract from the overall experience,” he says. The Bloch Building and parking garage aside, the museum now includes the Ford Learning Center, a new café, a research library, an expanded retail shop and a redesigned sculpture park. Conservation and storage facilities are located in the basement, which runs the full length of the Bloch Building. With the completion of the Bloch Building, the Nelson-Atkins Museum has expanded its available space by 71 percent, freeing up 45 percent more exhibition space. Although many masterpieces from the permanent collection will be on display indefinitely, the extra space won’t be over-utilized. “We didn’t want to expand so we could cram as much artwork into a given space as possible,” said Dana Knapp, project director. In addition to the African exhibit and contemporary exhibition space, 11,000 square feet of the Bloch Building will be devoted to special exhibitions. The flexibility of the space – huge sliding doors can be moved with literally the touch of a finger – allows for the Nelson-Atkins Museum to host a wide variety of traveling exhibitions. While viewing any of the permanent galleries is free of charge, admission to a special exhibition will cost “a few dollars at most,” Stuart says. 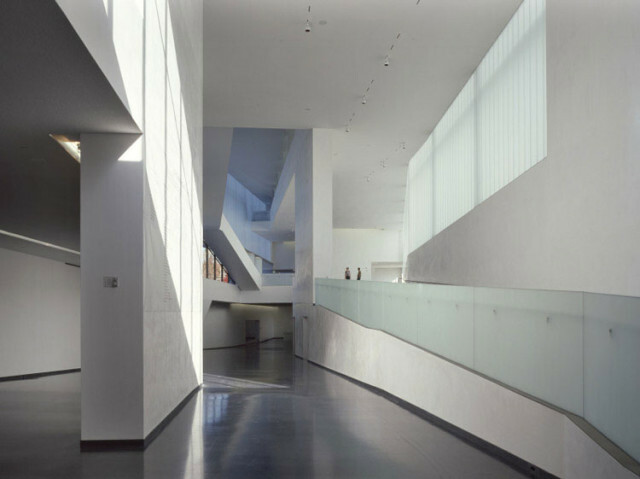 he founding principle of Holl’s design for the Bloch Building was for it to be a complementary contrast to the existing Nelson-Atkins building. Of the six architects who vied for the commission, he was the only one to take into consideration the iconic significance of the north face of the campus (the area adjacent Emmanuel Cleaver Boulevard noted for its postcard view of the oversized shuttlecocks resting on the lawn). And though the lobby to the Bloch Building now functions as the museum’s main entrance, Holl proposed that a spine be constructed to fuse the Bloch Building with the museum’s former main entrance, Kirkwood Hall. “He was the only architect who wanted to complement the existing building in every way rather than overshadow it,” Wilson says. Holl, a longtime subscriber to phenomenology – the study of how people perceive space – attested that his Bloch Building would be the feather to the original buildings stone; whereas the existing building was ponderous and heavy, his Bloch Building would be airy and light; whereas the existing building stood commandingly above grade, his Bloch Building would interweave with the landscape, occasionally rising above ground like an undulating serpent abutting an archaic ruin. Wilson says what sold him on Holl’s design was its potential to heighten a visitor’s capacity to view a piece of art. Several of Holl’s past architectural designs have drawn a tremendous degree of derision. Some critics lambaste him for his superficiality. When Holl’s plans for the Bloch Building first leaked to the press, he was assaulted for his failure to show any curiosity towards the original building. Sometimes Holl shoots for the moon and gets a weather balloon, Cassias says. In this instance, Holl shot for the moon and lassoed the stars. Since the Bloch Building’s groundbreaking six years ago, Wilson has fielded call after call from angry patrons who grumble about the ugliness of the addition. But the last six months have been different. He’s finally beginning to hear positive feedback. “Just the other day I saw someone hugging the exterior of The Bloch Building as if it were a loved one,” Wilson says with a laugh. He also remembers slogging through the torrent of negative comments from another once-controversial novelty at Nelson-Atkins – Shuttlecocks.